Discipleship is one of those church functions that sits just out of reach for most churches. Contemporary churches long for successful discipleship programs that are full of people and produces disciples who will in turn disciple others. But what if our approach is wrong? Discipleship has long been treated as a program, one that’s delivered primarily in a classroom setting over a few weeks. Many churches still treat discipleship in this manner (I’d be curious if it’s most churches.) There’s undoubtedly some kind of teaching component to discipleship. 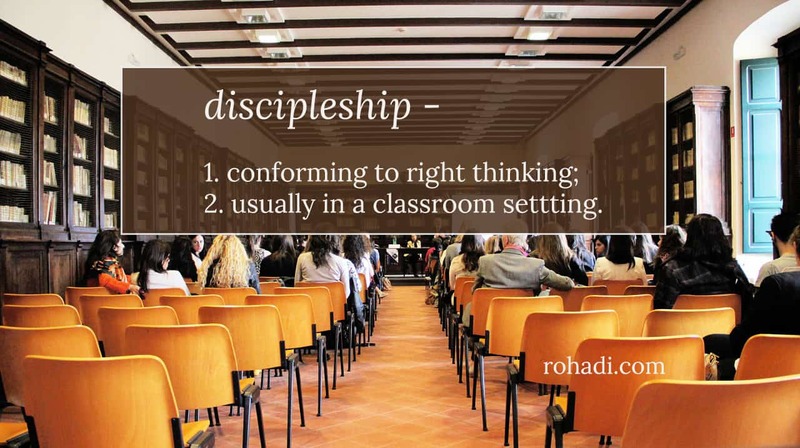 However, I believe discipleship has greater depth than the classroom experience churches tend to offer. What ‘good’ discipleship looks like needs a re-think. It’s not a classroom to train right thinkers. Rather, it’s a process of unleashing the dreams, visions, and gifts in people to creatively encounter then join the unfolding kingdom of God in our midst. One method builds conformity. The other, through relationship, seeks to build people to realize the fulness of their call–to realize the fullness of their humanity. When someone discovers this call, they can’t help but invite others into the same pursuit. In my own ministry, in an effort to extricate myself from the mountain of pre-packaged training materials at my fingertips, I’m opting for the other end of the spectrum (who knows, maybe the opposite ditch?). I’ve made a point to tailor discipleship to each individual. If discipleship is about relationship primarily, everyone will have different needs and will be on their own unique journey. That’s the opposite of conformity, assuming we can lump everyone onto the same track of completion. There are a few common attributes, scripture, prayer, narrative, but not much more. Whether or not this is reproducible, we’ll have to wait and see.